Genova Delicatessen is a classic Italian delicatessen with two stores located in Walnut Creek, California. We offer the absolute best in catering services and have our own factory where we create authentic Italian entrees, raviolis, sauces, pastas, and delicacies to sell in finer retailers throughout Northern California. Homemade and kitchen fresh, Genova Delicatessen evokes the true quality of traditional Italian food. Our recipes (and our family) come from beautiful Genova, a small port city in Northern Italy. 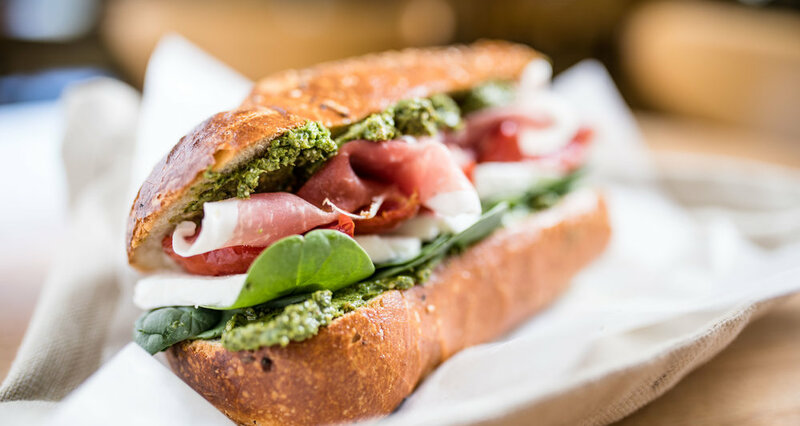 Since we established the first Genova Delicatessen in Oakland, California in 1926, our delis have been famous for our fresh bread, specialty cheeses, and the best cuts of meat. We also have terrific salads, an ever-changing variety of prepared entrees, traditional desserts, coffees, and regional Italian wines you can’t find anywhere else. We don’t use preservatives in any of our products, we strongly support local sourcing, and everything we do and serve is FDA approved. Thanks to our friends at Doordash you can have any of our sandwiches delivered directly to your doorstep. Fill out an order form and FAX IT to any of our locations. Your order will be waiting for you when you arrive. Coming into our stores but want to skip the line? You can text to order! View our retail list to see where your nearest Genova products are! All of our products are available wholesale. Call 925-938-1590 for more information. With your meals, after your meals, or just for fun, enjoy unique, authentic Italian wines from Genova. In both our stores we offer some of the best authentic imported Italian wines in the Diablo Valley. While we specialize in Varietal Rosso (Red) and Bianco (White), we also stock Super Tuscans, Italian regional and table wines. In partnership with “America’s Greenest Winery” - Parducci Vineyards Wine Cellars in Ukiah, California - we blend our own dry red and white wines to complement to complement the flavors of our food. Available in our stores only. Our family and our recipes come from Genova, an ancient maritime city in Northern Italy whose tradition and culture are renowned and unique. We brought our traditions and our recipes with us when we established our first Genova Delicatessen in 1926, in Oakland California. Since then, we’ve expanded quite a bit, but we’re still family owned and we still make everything ourselves using ingredients and processes our family is proud of. By Georg Braun; Frans Hogenberg - Georg Braun; Frans Hogenberg: Civitates Orbis Terrarum, Band 1, 1572 (Ausgabe Beschreibung vnd Contrafactur der vornembster Stät der Welt, Köln 1582; [VD16-B7188)Universitätsbibliothek Heidelberg, Public Domain. Be the first to know about special offers, events, and more!